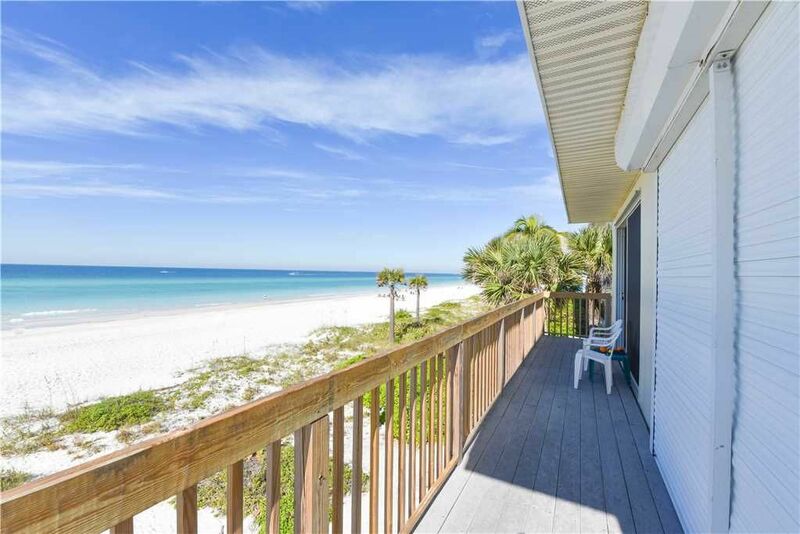 Capri Condo C is a quaint 2 bedroom 2 bath "nautical" retreat that is located directly on the Gulf of Mexico in Bradenton Beach. Just steps to the historic Bridge Street. The upstairs unit offers magnificent views of the white sandy beaches and waters of the Gulf. The balcony is located off of the living room and is perfect for watching sunsets. The kitchen and living room offer a spacious open floor plan. The condo has wood-inspired tiled flooring throughout the property. The Master bedroom has a King size bed and a private bathroom with a step-in shower. The second bedroom has two Twin beds and both rooms are equipped with ceiling fans in. The guest bath has a combination of a tub and a shower. This beachfront condo will sleep up to 4 people comfortably and has a queen pullout sofa in the living room for extra sleeping space for 2. Please note: There will be a $250.00 cancellation fee and any eligible refunds are subject to Anna Maria Vacation’s ability to re-rent the accommodation at the price contracted. If the home is re-rented (partially or fully), we will issue a refund in the amount we were able to re-rent the property for, less the $250 cancellation fee. Eligible refunds will be determined based on the difference between the contracted amount and the re-rented price, less the $250 cancellation fee. There will be no refund if the home is not able to be re-rented. We do not make any sort of guarantee that we will be able to rent the property for what was paid originally. 50% of your total rental amount plus tax is charged to your credit card at time of booking (We accept VISA, MasterCard and Discover). This is a part of the total cost of your reservation. The remaining balance due must be received within 90 days prior to your arrival. If the optional Traveler’s Insurance is purchased, the Travel Insurance premium payment is due at the time of purchase. If the reservation is made within the 90 days prior to arrival, the full payment is due and payable immediately by credit card (VISA, MasterCard and Discover). We are truly a unique rental company specializing in only the finest Anna Maria Island Vacation Rentals. Our carefully hand selected properties provide our guests the upscale vacation experience they desire. All properties are diligently maintained on a weekly basis with emphasis put on each unit being kept in peak condition. We have luxury Gulf beachfront homes and beach condos, bay waterfront homes and many exquisite inland homes just a few minutes stroll to the beach. Our staff diligently clean and maintain each property thoroughly in preparation for our next guest. We have recently introduced a Professional Linen Program which many of our properties are participating in. This offers our guest the option of a whole new level of luxury and comfort on their vacation. Live the simple island life when you stay at Capri Condo C. This property is not only beach front, but it is right across the street from Anna Maria Island's famous Bridge Street. You're in the middle of it all! You have the beach as your backyard and everything else you'll need on the other side. Grab some lunch at the Island Time Bar and Grill or head down Bridge Street to the Anna Maria Oyster Bar on the Pier and have a meal with a gorgeous view of the Bay! Looking for an excursion during your stay? Visit Adventure Away's booking office located on Bridge Street to book your choice of of land, water, or air excursion. On the second floor, you have a great view of the Gulf. Wake up in the morning to a beach view and have a cup of coffee out on the balcony. Capri Condo C is a cute island cottage that will have you living the local island life. You have the Gulf view from the kitchen and the living room! There are also chairs outside on the balcony for you to bask in the sun and listen to the waves. Relax and enjoy yourself during your stay! Bathroom #1 has a full bathroom with a walk-in shower, Bathroom #2 has a full bathroom with a bathtub. This property is located on the second floor and is walking distance from Bridge Street. It is on our Professional Linen Program so you don't need to worry about linens or towels. There is a Smart TV in the living room, tv's located in the bedrooms, and 2 DVD Players. This property also has an outdoor shower after a day on the beach. We would definitely stay here again. The location can't be beat. Having the beach right outside the door was perfect, and we could walk to many shops, restaurants, and bars. All kitchen equipment you could need was provided, noise was never an issue, and Netflix was available! We were very happy. Thank you for taking the time to leave us such a great review for Capri Condo A. We are so glad to hear that you enjoyed everything at this property. I have shared your very kind words with the rest of our team! We can't wait to help you plan your next getaway to Anna Maria Island! We enjoyed our relaxing vacation on the Anna Maria Island and this property contributed to it. The Condo is located right on the beach and was super clean and comfortable. We enjoyed the view of the gulf right from our living room and a balcony. It was very convenient to take our stuff and step on the beautiful white send. Thank you for the five star review, Aleksandr! We are glad that you enjoyed your stay on Anna Maria Island, and that the condo contributed to your relaxing vacation! We are happy to hear about your enjoyment during your stay! We hope you come back again!